Le Tour winds on through the magnificent French countryside after its visit to Italy with no further clarity on the likely winner. Australian Cadel Evans who started the epic as the bookies favourite surrendered the Maillot Jaune, the leader’s yellow jersey on the final slopes of the horrendous climb to the summit of the Alpe d’huez on Wednesday. Evans now sits in fourth place only one and a half minutes behind the leader after 18 stages and more than 1400 miles! And so it all comes down to Saturday’s individual time trial over 53km, a discipline at which Evans the former world mountain bike champion excels. Specialist mountain climbers like the men in front of Evans get their prowess from a high power to weight ratio and are uniformly small men. The bigger more powerfully framed athletes enjoy the advantage on the sprint stages and then there are the time trial specialists, men who can handle all conditions and who can ride alone against the clock. Evans is one of these and on Saturday his task is to pull back the advantage that others gained in the mountains. Traders and Le Tour riders must always be aware of time but to that already complex subject traders add price. Gann said that when time and price are equal a turn in the market will occur. Factually this statement may be correct but not one in a million traders actually know what it means, and probably Gann didn’t either. Most try to interpret this exhortation as something that can be graphically represented on a chart, that is as different axis of the same plane. Often enough gurus (with a very small “g”) will give examples such as “1203 points in 1203 days”, and assert that at such an esoteric place time and price will be equal and a turn will result. On the rare occasion that such an event happens it can readily be ascribed to happenstance as chi squared will not validate it as other than an interesting anomaly. Like most of Gann’s market insights this one originated with his mentor the famed British Theosophist and Freemason, Walter Gorn Old (1864-1929) the mysterious “Sepharial”. Sepharial timed market movements by astrology and used astrological “houses” as timing marks, a practice that many modern traders waste their time trying to emulate. When Sepharial referred to “time and price being equal” he did not mean they were equal to each other but that they were in an equal position on his astrological clock to that at which a previous significant turn had occurred. In other words he looked for market turns at astrological anniversaries which the modern analyst commonly mistakes for an anniversary on the Gregorian calendar. Much of Sepharial’s work was applied to the world of horseracing where for many years he was a racing columnist and tipster for The Times and applied his astrological observations to winning selections with some success. Gann too was a race lover and frequented the Florida tracks during his annual leave where he would eventually marry a lass who worked in the Orlando totalizator office. But I digress. Sepharial’s handicapping method, parts of which he published, relied primarily on the position of the moon’s theoretical shadow or “elongation”. In so doing, Sepharial was explicitly adopting a lunar calendar. The Hebrew calendar about which Daniel prophesied so presciently, it shall be for a time, times and a half, is a lunar calendar and so we come full circle. From the man clothed in linen, who was on the waters of the river to Daniel, called by the Persians Belteshazzar, to Sir Isaac Newton, to Walter Gorn Old called Sepharial, to the Danielcode; they are wheels within wheels. Eze 1:16 And their appearance and their workmanship was like a wheel in the middle of a wheel. To morph from the ultimate truth of Scripture to the banalities of markets (show me the money sport), we revisit this chart of the Dow published by Financial Sense for my previous article “Le Tour-Directions for the S&P” on July 8th. I have highlighted the next Daniel number in the sequence below the massed support around 11050. It was 10837.70, the original chart of which is available to skeptics in the FSO archives. The important trading low in the Dow came on 07/15 at 10828.00 just 9.5 points from the DC number published for you all seven days earlier. Neat enough? For followers of the Danielcode, the wheels within wheels spun far enough on the minor time cycles that for Wednesday July 16th the T.03 time turn indicator at the Danielcode website issued one signal. Buy! This “time turn” indicator works off a variant of Daniel’s cycles originally written as a timing mechanism for the Hebrews. Like all timing mechanisms, the original inputs must be modified to compensate for changes in trading times. For Daniel, his concern was for the “End Times”, but a byproduct of that enquiry revealed the correcting factor for time as it was measured in 640BC. Sundials. Sepharial was concerned with a six day trading week and modern markets require adaptation for RTH and increasingly, continuous electronic markets. All of these changes require compensation in the math but for devotees of “time” analysis I can tell you that the Biblical or Hebrew calendar is your starting point. Sepharial and Newton knew this and the Danielcode is based on it. That is where ultimate truth begins and ends. The DC number we were looking for was 11693. Wednesday’s high was 11697 a variance from target of just 4 points. So the Daniel sequences again were precise. 9.5 points off at the low and 4 points off at the high with both the turn up and the turn down marked by the Daniel time turns and these were the only time turn signals issued on this market. Nothing fancy; no minor waves or squiggly patterns. Just the low and the high and the time of both. Show me the money indeed. Some part of 869 Dow points up and 351 down is an important trade, and it is these giant trades that move your P&L. Exactly the same game played out on the S&P with the Daniel number sequence identifying 1200 as the next probable turning point and 1290.37 as the first target for the rally in the index. Neat enough? If not, perhaps the rally target on the September futures contract at 1290.90 just one tick from the rally high will suffice! The aim of the Danielcode website and my frequent articles which are so graciously hosted by Financial Sense is to spread awareness of the Danielcode and its Biblical antecedents; to provide individual traders, including the little blokes, with the information that the big boys use, and to enlighten you as to what markets really do. Which is not at all what market media represents it to be. In earlier articles we observed how the US Fed, wittingly or unwittingly used the Daniel number to engineer market rallies (see “Crikey!”, 01/23/08 in FSO archives) and after the markets closed on 07/15 the fiscal fiends, in this case the US Treasury in conjunction with the SEC, again chose the DC price targets to manipulate trading rules with the intention of defusing selling pressures particularly in the banking and GSE mortgage sectors. Markets are rarely thwarted for long and Thursday’s sell off supposedly came on housing news: Weak existing-home sales batter stocks. Washington Mutual, Fannie Mae and Freddie Mac are especially hard-hit. Ford's big loss slams its shares -- and GM's. High energy costs hurt Dow Chemical earnings. Our special T.03 time turn indicator creating the sell signals in the Dow and S&P was posted at 8:21 PM Wednesday US ET. Got that? The sell signals were created 4 hours after the close on Wednesday. The price targets were determined and posted the previous weekend. S&P in after hours markets on Wednesday night was +1.6. The idea that the housing news was in fact “news” to the market is rubbish. The shorts of the Gnostics were in soon after the T.03 signal was posted. The selloff on the 10AM announcement was just the herd making the trade good for the big boys. Markets do what markets do and the entertainment industry, is paid to find some news to explain it. This they do assiduously and to public acclaim which has always amused me. Why some dolly bird who “explains” market moves when they are over should be accorded celebrity status is beyond my simple level of comprehension but accords with current behavioral norms. Mindless. Chinese Walls too have celebrity status. 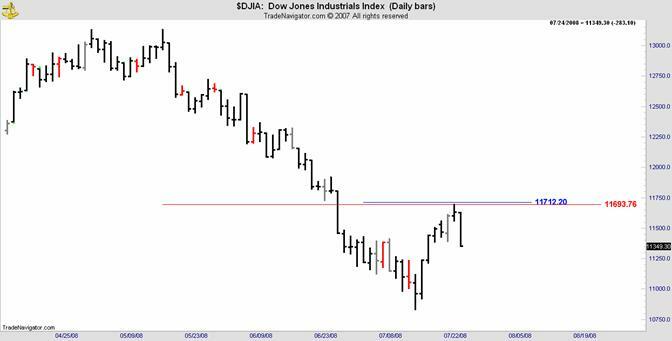 We do well to remember that the overarching construction feature in these walls is porosity as Thursday’s price action in the major indices again demonstrated. This is the 151 minute chart. You should have recognised the 29.7% retracement of the swing marked in red. This is straight out of the DC trading manual which you need to read more carefully. Your question was “How would I know that if I day traded this, that 1247 was a good entry to go up today when it opened?” Here is your answer. This market did what all markets do all the time. It followed the Danielcode. 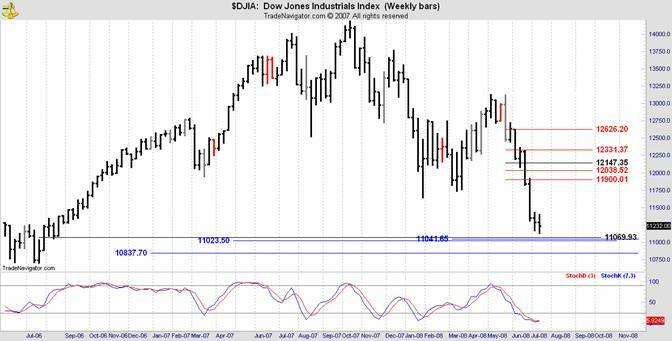 Having got the market down to DC support you have to go to a still smaller time frame to see the turn. I trade the big S&P so I use WP but you will see the same thing on ES. The problem with indices is that low volume bars during quiet periods distort the stochastic. In other words if you are looking at time bars, a bar in the middle of the night with very little volume has the same value as the first hour of RTH where there is huge volume. 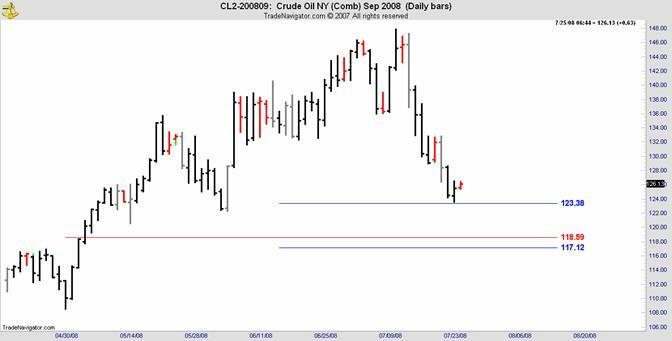 To overcome this problem we use “tick” charts where each bar has the same number of trades and therefore the same weight in each bar. You can change the number of “ticks” to change the basic time period. Now we have bars of equal volume and we can start to see inside the market. 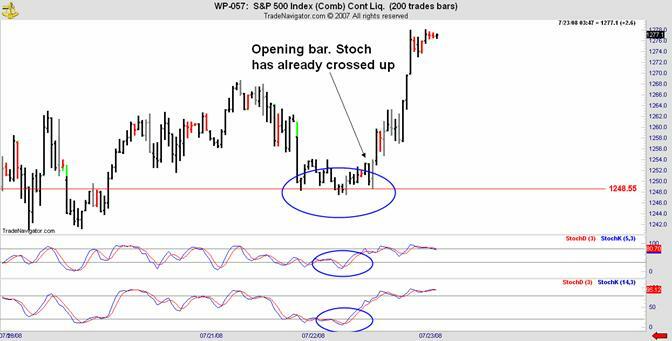 This is a 200 tick chart of WP-057 with just the standard stoch and the DC retracement. You should be able to see the DC number tested 3 times before the stoch crossed up and the market took off. So the best way for you to trade as a day trader is to watch for DC support and resistance and take a trade with the larger trend when you see the setup. Markets follow this behaviour constantly. It occurs on all time frames. Like our riders on Le Tour, each market has its own characteristics but once we know their behaviour it is highly repeatable. This particular move is written up in the DC Trading Manual available at the Danielcode website. Go ahead and read it. It is free. Watch for it to happen again and again. It is a regular performer on the big boys calendar. Gold continues to frustrate bulls longing for the resumption of the currently adjourned bull market. With what is waiting to unfold for equity and debt markets in the coming months, the probabilities for Gold definitely favour the optimists but perhaps not in the way they envisage. 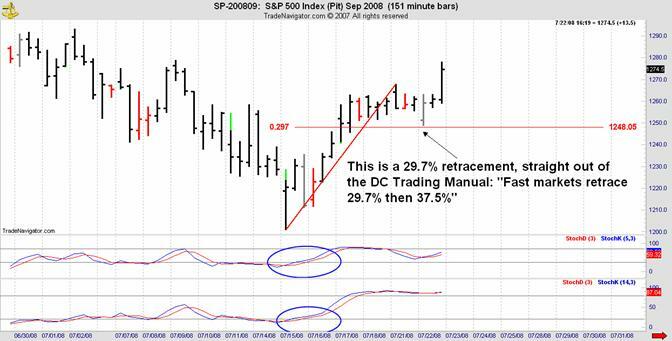 We have recently introduced weekly and monthly trend charts at the DC website which are free for Financial Sense readers. These are unusual binomial charts which generate slow, long term signals suitable for investors as opposed to traders who will favour daily charts which identify the tradeable swings. In the trend charts we show weekly and monthly buy and sell signals and the precise price points at which those signals will be confirmed or fail. This introduces a degree of discipline and rigor into the investment process which appeals to me. The charts cover Gold as well as the HUI index. The process of generating signals links time periods and D2 or derived data. This means that if the signals in our primary market, Gold, are valid they will be confirmed by another time series (the monthly signal will agree with the weekly signal) and the signals in HUI will support the Gold signals. The logic argues that if Gold prices are rising on true demand then the unhedged Gold mining stocks that make up the HUI index will also experience rising investor demand and hence price appreciation. The nexus between Gold and HUI has been well understood by many. The trend charts, updated every Sunday bring consistency and codification to the signals. 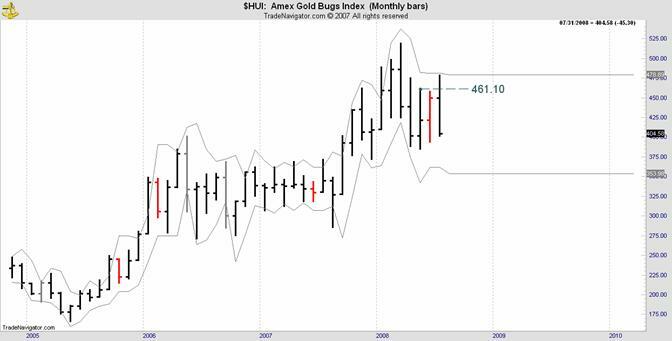 So far we have had anything but confirmed signals, The weekly Gold chart issued a buy signal that is not confirmed on the monthly chart, and HUI in both time categories stubbornly refuses to shift off its weekly and monthly sell signals. 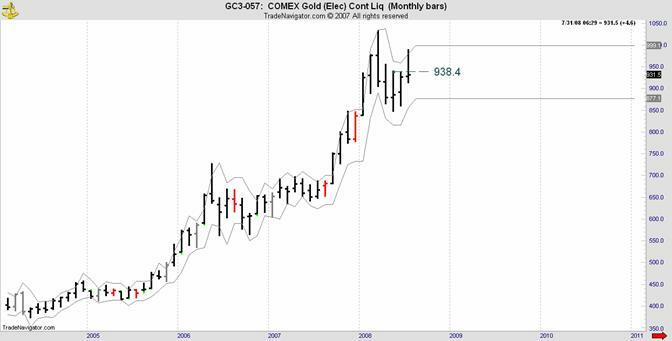 This is the monthly binomial Gold chart that requires a monthly close above 938.40 to negate the current sell signal in force. The HUI monthly chart requires a monthly close above 461.10 to negate its current sell signal. Promising efforts earlier in the month look dismal now. For patient investors I recommend that you consider incorporating this multi layered approach into your decision making. For Gold traders this methodology is way too slow but the daily Daniel number chart will keep you on the right track. I have long pointed out the obvious, that Gold is trading inversely to the US Dollar. I am beginning to believe that this relationship will decouple in the near future. I believe that Gold will continue to maintain good prices within a trading range and will likely put in another attempt at the highs, but that rush will not be supported by HUI or a decline in the US Dollar. I will expand on this theme at a later date. 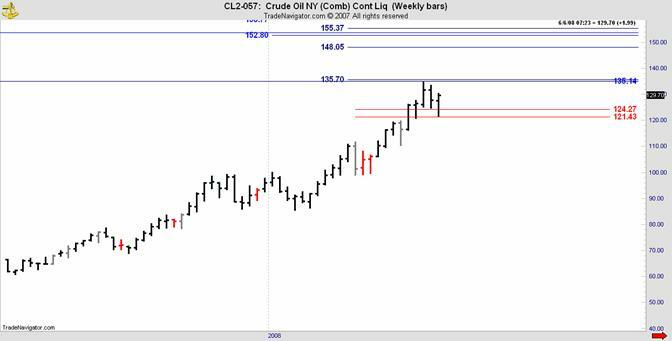 July’s high in Oil came at 147.90 just a few ticks from a major DC target. The first target down, now in the September contract for this week was 123.38 and here is the posted member’s chart. John, AUD turn NICE !! Been with you now for about 6 months, still hardly a day goes by when I look at the DC numbers and can't help but saying WOW out loud to myself. Thanks for sharing your knowledge. Randy I appreciate Randy’s comments greatly. Writers too need love and recognition. In truth I have to say that my knowledge is extremely limited. The glory belongs to the Danielcode. I am but its flawed interpreter. In Le Tour, some are climbers who shine on the monstrous stages in the Pyrenees and the Alps. Some are specialist sprinters like the 24 year old Englishman Mark Cavendish who ignited Le Tour with his four separate stage wins. Cavendish will now represent Great Britain in the Olympics and more Gold beckons. Cavendish can’t climb and climbers can’t sprint. They are all Tour riders but all unique. And so it is with markets. Today we have gone from the adventures of a day trader in the S&P to long term signals from a monthly chart in Gold and HUI to finding the top in Oil from a weekly chart published by Financial Sense five weeks and $11 before it happened. If nothing else perhaps these offerings will encourage you to read this publication with a greater degree of care. If you missed the recent low in the Dow or the top in Oil, be more careful next time. The Daniel numbers which define these markets were here for you all to see. This surely was uncommon news for the wise investor. Market movements, time cycles, astrology, horse racing and Le Tour. They all go round and they all rely on orbits and wheels. I invite you to visit the Danielcode Online or to email me to learn more about the Daniel number sequence or simply to update yourself on the Gold and HUI trend charts. For forex and currency traders in particular, think what it would mean for your trading to have the high probability DC turning points on your charts, days and weeks before the turns. You too could see what Randy sees.